Each year, I’ve listed my opinion on quality of teams, fan support, state organization, etc for the states I’ve seen games in person. In years past, Texas is head-and-shoulders above the rest. There’s a bit of a change this year. At the top, it’s obvious. (1) Texas supports High School Football unlike any other state. (2) Ohio shows great support at the lower levels in the regular season to a degree most states can’t touch. A surprise for me was Indiana (4), who came out in droves for their state championship games. Sure, a dome helps, but you have to be a fan or really support your school to come out for the games. 46,455 came out for the two days, an average of 7,742 per game. For a ‘basketball state’, that was quite unexpected. Especially compared to Pennsylvania (4), whose largest crowd was 4,437 for Beaver Falls-Middletown. Middletown was only 11 miles away from Hershey. A total of 15,421 attended the six games. Aside from the poor championship showing, regular season attendance on the west side of state is pretty solid, even for small schools. But, playoff travel is near non-existent. Delaware (5) was a huge surprise to me. The Middletown-Smyrna game had a huge crowd for the Division I Championship. A small state, but the fan support was entirely unexpected. And the stadium catered perfectly to the crowd. New Jersey (6) has always been middle of the road, to me. Despite seeming like a state that wouldn’t support high school football, they do. But, it’s definitely at a much smaller scale. Their championship games are, to put it mildly, ecclectic, but this time I attended the South Group championships at Rowan in Glassboro, and was surprised how the first game crowd was quite well attended. The last three, West Virginia, Tennessee, and Kentucky (7-8-9), are about what you would expect. 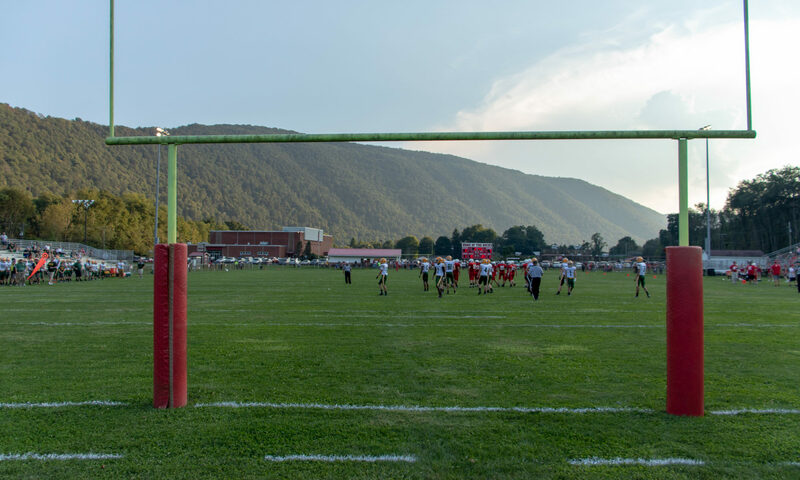 West Virginia supports HS Football, but the crowds can be paltry. The Clinton-Oak Ridge game was my only Tennessee frame of reference, and it was decent. Kentucky, unfortunately, has to be last. The four games I saw at two ‘bowls’ were mild crowds, though there was rain through the first game in Harrodsburg. But, for size of the schools playing, crowds should be expected to be larger. Texas (1) is Texas. It’s not so much the big schools, as I think Ohio (2) and Pennsylvania (3) can keep up, but it’s the smaller schools where Texas excels. Football is huge. And the football-centric world of Texas, the smaller schools devote much more time and effort. A team such as Bremond, for example, would dominate comparatively sized championship level schools in Ohio or Pennsylvania. Unexpectedly, Indiana (4) was quite good at the championship level. Both public and private schools participating in the six games. New Jersey (5) is a lot better than most fans give credit outside the big parochial schools such as Paramus Catholic, St. Peter’s Prep or Don Bosco Prep. Kentucky, Tennessee, and West Virginia (6-7-8) aren’t bad, and they’re not great. They’re just somewhere in the middle. Delaware (9) has the unfortunate spot of last, but AREN’T that bad. Without seeing games in New York, there wasn’t really a ‘bad’ state as I’ve posted out in the past. Delaware’s problem is just that there’s so few schools, that you’re not really seeing teams of ‘state championship level’ as you think in Ohio or Pennsylvania, or Texas even. But, they are what they are. This year, I attended fewer ‘events’ than in past year. Primarily avoided New York due to cold or travel on particular weekends. Last year, I knocked Texas down several pegs because the games had been moved from AT&T Stadium to NRG Stadium. Which was a huge downgrade that accompanied much smaller crowds. With the games returning to AT&T Stadium this year, I would have expected to bump them back up to the #1 spot. Now, this isn’t to say that the UIL championship games at AT&T Stadium shouldn’t be on a high school football fan’s bucket list. But, it just means something else was a tad better. And that was the Indiana Finals held at Lucas Oil Stadium. Only six games instead of Michigan’s eight, my wife and I decided this year to try ‘new places’ for games. And that meant a trip to Indiana. Partly, this decision was driven by having an infant with us. Indiana is, as the lady at guest services stated, ‘very baby friendly’, and they weren’t lying. Many family had young children in strollers, and freely could move about the stands and utilize the overabundance of ADA seats to sit with their children. Texas didn’t allow such accomodations, and meant keeping our daughter with us at our seats. Secondly, you are allowed in-out privileges which made things easier, and they didn’t enforce the ‘clear bag policy’ most NFL venues enforce even for high school games. Texas is still great, but Indiana was just better. Lucas Oil Stadium is a ‘smaller’ AT&T Stadium. It may lack the marble in the club level, but it also had the college conference championship games on television in the club level along with the game going on just a few feet away. The seats are great. Especially the seats between the 30s were similar to AT&T club level seats. And, unlike Ohio, the games are scheduled quickly together. Starting at noon, 3:30pm, and 7pm. More free time before and after games. And yet, Indiana handles ingress-egress just as well, if not better, than Texas. The next spat of events were simple doubleheaders. Delaware was great in that it’s easily accessible, decently sized and run stadium. Games were put on well, and worth the effort to attend. My second trip to the Death Valley Bowl in Stanford, Kentucky was just as entertaining as the first. Lincoln County has a great, simple, venue and the games hold a certain sense of purpose that some of Kentucky’s bowls lack. With the WPIAL schedule changing, New Castle setup a doubleheader at Taggart Stadium featuring two good matchups. Aliquippa-New Castle and suburban Neshannock against Farrell. The WPIAL finals just get lost in Heinz Field. The stadium does little to make it a fan-friendly event. Giving the impression it’s a hassle to even stage the games. At least unlike the Maryland finals previously held at M&T Bank Stadium, they do have the videoboard in operation. As referenced earlier, some Kentucky Bowl games lack a sense of purpose, and that fits the Fort Harrod Bowl. The stadium isn’t that great or grandiose. All fans sit on one side of the field. The crowds were lacking (though the rain definitely contributed to that issue), and there were certain things lacking. And lastly, was the Pennsylvania finals. With the move to six classifications, PIAA switched to one game on Thursday, two on Friday, and three on Saturday. Due to Hersheypark Stadium’s antiquated construction, there isn’t any auxilary lockerrooms. Which means a long time to clear out the stadium to get ready for the next game. Next year, PIAA plans to play two games a day for three days . The current setup prohibited me from attending the Thursday game, as both the matchup and added travel (as I attended alone) didn’t make it worthwhile. And then, the 8pm Saturday game meant leaving after the second game to head home. Throw in the fact the stadium is a concrete wasteland and was never specifically built to accomodate a football field. And the crowds are pathetic. Normally, I wouldn’t rank these games. However, Springfield-South Range was, by far, the best game I attended all season. The game was just a great rivalry matchup, back and forth, and the end of regulation and overtime was just phenomenal. Wadsworth-Twinsburg was a lightly attended televised Thursday game that just was much better than the matchup would indicate. Twinsburg came back valiantly, but in the end the better team ended up winning. Indiana’s championship games had two great games, with Carmel beating Center Grove in overtime, and Westfield beating Columbus East, both by three. And lastly, Refugio and Crawford nearly went to overtime before Refugio’s game winning field goal at regulation. With thirteen shutouts, they figured prominently in my ‘worst games’, but not every shutout was ‘boring’. Sometimes it was a new venue, new team, or a competitive game gone bad. One, though, stuck out. And that was the Grand Valley-Valley Christian game in Poland. A rainy dreary evening opened into a cold, though dry, night game that was entirely one-sided. Canon-McMillan-Shaler was a game I wasn’t really looking forward to based on the matchup, but wanted to see the redone field at Shaler. It wasn’t really worth the game, though. Shaler hasn’t been good for years. And it lived up to it again this year’s Saturday afternoon homecoming game. 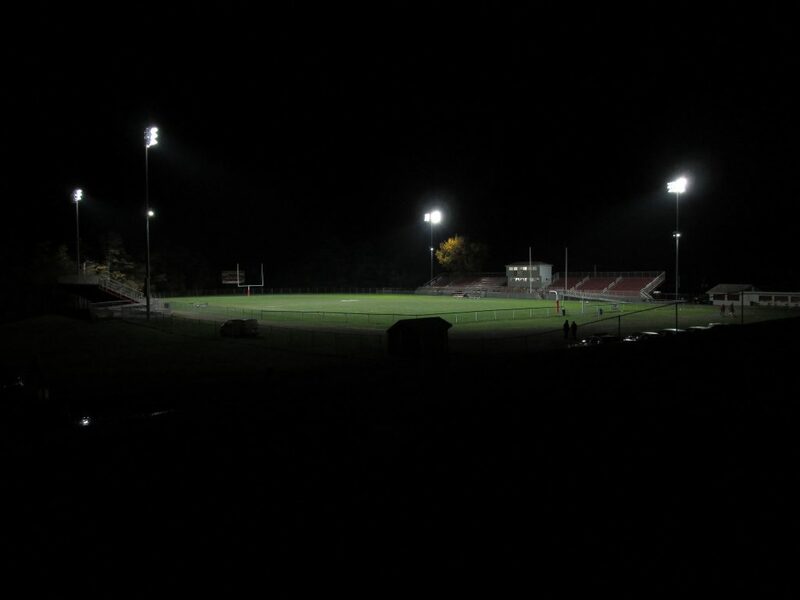 Farrell-Cochranton was one-sided, and only exacerbated the boring nature of the game when West Middlesex-Cambridge Springs a few miles away at Hickory turned into a last second thriller. But, in this case, venue was chosen over matchup by the missus. In Week 15, the original plan was to attend a Friday night championship in Annapolis, Maryland at the Naval Academy. But, with Navy hosting the AAC Championship Game, the games were moved back. With the Saturday and Sunday games in Delaware and New Jersey already planned, it was up to finding another game close by. And with six ‘eastern’ PIAA semifinals, we chose the game closest to Delaware. And it wasn’t close. Archbishop Wood is great, and Academy Park was… not great. It was cold, windy, sparsely attended game in a venue befitting a 2A school, rather than a 5A State Semifinal. And it was one-sided. And lastly, was a 6-man game. Both UIL 6-man games ended with the 45 rule. Which, to the unitiated, is the rule that when a team leads by 45 or more points after halftime, the game ends automatically. But, Richland Springs-Balmorhea was a shootout, at 96-50. Jonesboro, on the other hand, started to lose their grip on the game early and Borden County ran away with it. For the seventh straight year, I can’t fathom trying to rank all the teams I saw myself. So, again, I’m using calpreps again. Also, these teams are listed with calpreps naming conventions. I just didn’t feel like retyping them all. Without seeing title games in Ohio, the top is a bit Texas-centric. I thought DeSoto was the best team I saw this year. Archbishop Wood was up there. Have no idea how The Woodlands managed to be so high. That one is a bit of a surprise. For worst teams? Not many issues. Lowellville was one of the worst teams I’ve seen in a long time. Ashtabula St. John was close. A bit of a surprise Pymatuning Valley was ranked so low. Mercer is a bit higher than I expected, as well. This was the fifth straight year seeing primarily Ohio or Pennsylvania games. My wife and I kept true with seeing games in new places. Even if that limited the overall number attended. Which meant foregoing New York or Michigan in favor of title games in Indiana, Delaware, and southern New Jersey. Also, branching out to more interesting or unique Friday night games. The plethora of Thursday games, especially in the playoffs, were a lot more than in the past. We ignored heading to Iowa this year simple for logistics. Of the 84 games I attended, my wife attended 63. And our daughter attended 48. My wife didn’t travel with me to Hershey for the PIAA championships, and she also stayed at the hotel in Arlington for the Friday games. The other games were intermittent Thursday or Friday games where she either didn’t go due to weather, didn’t feel like it, or in one case went to a concert with a friend on a Friday night. Our daughter attended the Tennessee and Kentucky games, as well as trips to Indiana, Delaware, New Jersey, and 8 of the 12 Texas games. Two seasons ago, we drove 21,190 miles attending 127 games. Last year, it was a much more mundane, 12,840. This year, despite 13 fewer games, we still drove a total of 12,308 miles including our jaunt to South Florida after the Texas title games to spend Christmas with her family. Luckily, gas is a very minor expense because she gets free gas from her employer. Though, that is limited to eastern Ohio and western Pennsylvania. So, only the longer trips meant paying. And our car averages 38mpg, so even then it’s a minor expense. We didn’t head out to Iowa or New York. With the goal seeing new stadiums and traveling to new places, the season wasn’t planned out that much in the future. Due to temperature and time, we decided to not see the Corky Kell Classic in Georgia in Week 0, and instead stick to the tried and true Thursday game in Tennessee and then two doubleheader Bowls in Kentucky. After two straight years of attending the Kickoff Classic in Syracuse at the Carrier Dome, we decided to stay out of New York. The only real plans were to attend playoff or championship games in Iowa, Michigan, Heinz Field, Hershey, and Texas. Iowa was quickly scratched, and with Ford Field not allowing strollers, we decided instead for Indiana. Which is a must do and will probably be back again. Hershey was simply a matter of nothing else going on locally. For Week 15, the options were Columbus, Wheeling, or head east to Maryland/Delaware/New Jersey. Wheeling was the early favorite. My wife didn’t like the idea of the schedule Columbus had with games at 8pm and then starting again at 10am. Wheeling would be fun, as it was last year, but with only three games, it is a little underwhelming. For the regular season, there wasn’t many ‘must have’ places to see. An original plan was to see Maplewood-Erie Central Tech on Friday, then games at Sheffield and St. Marys on Saturday. However, the Maplewood-Central Tech game was moved up a day to Thursday. But, we still have two nights in our hotel booked. So, we attended Thursday night at Maplewood, and then Friday night saw Union City-West Middlesex. With havy rain forecast for Saturday, and a few games postponed from Friday night, we planned to head south. Originally to Riverview, but with rain still not letting up for hours, we traveled to Wilkinsburg to see Imani Christian host Springdale. The benefit was two-fold. I’d never been there, and it had a roof. Which was a big benefit. Then, it was on to Fredericktown for Bethlehem-Center hosting Charleroi in a game postponed from Friday. Six years ago, I attended 55 games. I attended 73 in 2011. I attended 100 in 2012 and again in 2013. In 2014, I attended 127. And 97 last year. With the 84 this year, that’s a total of 636 games in seven years. And 508 in just the past five seasons. With the addition of Delaware, I’ve attended high school football games in 33 different states. And some type of high school, college, or professional game in 38 different states. 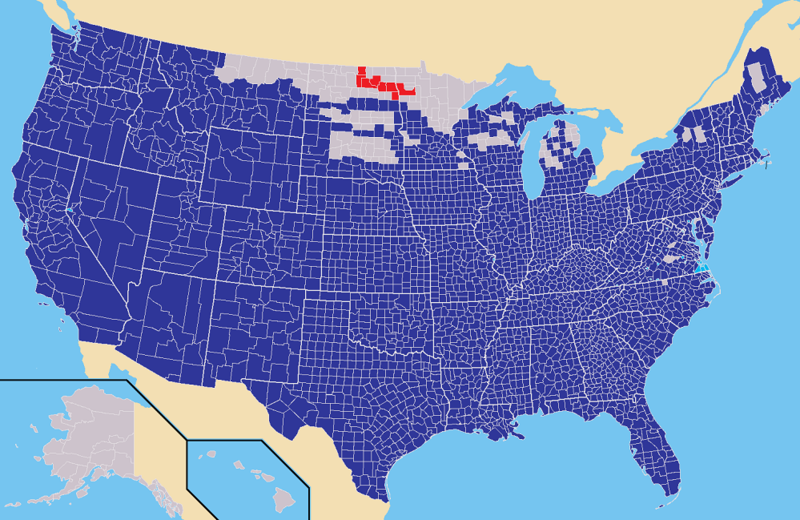 During this year’s travels, I’ve continued my quest to visit every county in the United States. During the year, I marked 94 new counties or independent cities off my list. As of December 31st, I have 172 counties or independent cities to go. Though, 2016 is the first year in a while where I didn’t ‘clinch’ a state. Though, I got North Carolina and Maryland close with only one more to go, each. As with previous years, I tend to avoid stadium fare simply because it’s usually repetitive and not noteworthy. So, instead, I’ll continue to reference restaurants and eateries along our travels, instead. Though, I will make note that the Brisket Nachos at AT&T Stadium are great and well worth the $12 pricetag. After finding this place last year, we went out of our way to stay there again this year. It’s well worth the stay. To stay in a train car for about $80/night was fun. And something we’ll probably do again in the future. Extended Stay America is a good hotel chain if you’re going to be someplace for a while. Mostly because of the ‘apartment’ feel to it. Arlington-Six Flags was a bit lackluster, but the Indianapolis Airport ESA was nice, clean, and well appointed. When I’m someone traveling for an extended period, Extended Stay America is my go-to hotel chain. And I’ve yet to be let down at any of their locations. As in years’ past, Lee’s Chicken, Culver’s, and Whataburger are regular ‘fast food’ stops when I’m in Kentucky, the midwest, and Texas, specifically. It’s all fried, but it’s really good. Especially the Oysters, Scallops, and Shrimp. Price is reasonable, but it’s a non-descript strip mall location. Nothing fancy, just good, cheap seafood served to a rather brisk clientelle. Small market and eatery located at the corner of US158 & VA168. Alligator Bites weren’t anything special, but weren’t bad. A light breading of tail meat. The Oyster Po’Boy was well worth the $8.99 charge. Wife had the Shrimp Po’Boy and said it was good, as well. Right now, there isn’t much in way of plans for next season. The Corky Kell Bowl in Georgia to open the season would be interesting, but entirely based on the weather and temperature and IF the games are held at the new Mercedes-Benz Stadium. We’d like to return to Indianapolis. And are considering a trip to South Dakota. Their title games are held in the Dakota Dome at University of South Dakota in Vermillion. Then, the following week, the MSHSL semifinals are held at the new U.S. Bank Stadium. It would be the third venue in Minneapolis to attend games. And South Dakota would mark another state off my list. And, with the plan to alternate Christmas between Florida and Ohio, we’ll be making a bee line from Texas home. But, with Florida holding their title games, at least four of them, the previous weekend, the thought is to go to Orlando in Week 16, and Texas in Week 17. But, at this point all these plans are entirely preliminary. In the end, wherever we go, or whatever games we see, we’ll have fun exploring the world together. Later this winter or spring, I hope to get pictures up from this year’s travels. I have pictures from every season located on my flickr account. I know that was a lot, but hope you’ve enjoyed reading it. Hope your 2017 is better than 2016.